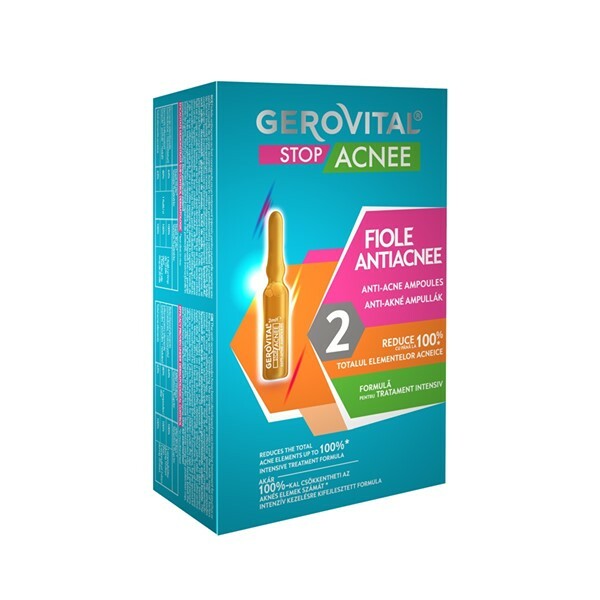 The Gerovital Stop Acne Anti-Acne Ampules kit has been developed as an intensive treatment for pruritus or recurring acne. Considering the complex problematic and the wide range of factors involved in acne pathophysiology, the recommendation for an effective acne treatment is to combine actives that target as many pathogenic factors as possible. The ampules contain a serum rich in active principles that act synergistically and complementary: Synactin® AC, salicylic acid, niacinamide, dipotassium glycyrrhizinate, sodium lactate. Synactin™ AC – Globally approved, the active was specially designed for the treatment of acne-affected skin. It works by modulating all five key anti-acne targets: regulates follicular keratinization, decreases sebaceous gland activity and follicular bacterial overpopulation, reduces inflammation and post-inflammatory hyperpigmentation (PIH). Niacinamide and Salicylic Acid are two actives very compatible with Synactin™ AC, working synergistically. Niacinamide is an effective skin-repairing ingredient that can prevent acne breakouts and rosacea lesions. Has an anti-inflammatory effect, increases skin hydration, brighten skin tone and improve skin texture. Salicylic Acid is a type of beta-hydroxy acid (BHA) that can help treat acne by exfoliating the skin and helping to dislodge dead skin cells that can clog pores. Sodium Lactate – An effective emollient and humectant that smooths skin by filling space between skin flakes. Usage: Apply daily, at night, on a clear skin. If you are using other Gerovital Stop Acne products, while using the Anti-Acne ampules do not use in the evening the Gerovital Stop Acne Ultra-active Cream or similar products. In the morning you can use all skincare products accordingly to the daily routine. The Gerovital Stop Acne Anti-Acne Ampules are available in a 10 ampules kit, necessary for 10 days of treatment. For more severe cases, we recommend to continue treatment with another 10 ampules. For the second kit use one ampule every 2 days. Agitate the ampule before use! Get the serum entirely at the bottom of the ampule. Make sure you hold the ampoule standing before breaking it, to avoid spilling the product. Break the serum ampoule using a tissue paper or textile towel. Read the instructions from the leaflet inside the packaging if use the protection cap to break the ampule. Pour the content into the palm of your hand and apply it on your freshly cleaned skin by gently massaging it. Not suitable for children under the age of 3 and persons allergic to aspirin. Avoid contact with the eyes! Apply daily, at night, on a clear skin Agitate the before use! Get the serum entirely at the bottom of the ampule. Make sure you hold the ampoule standing before breaking it, to avoid spilling the product. INGREDIENTS: AQUA, PENTYLENE GLYCOL, SODIUM LACTATE, PEG-40 HYDROGENATED CASTOR OIL, PROPYLENE GLYCOL, ALCOHOL DENAT, NIACINAMIDE, DIMETHYL ISOSORBIDE, SALICYLIC ACID, DIPOTASSIUM GLYCYRRHIZATE, CAPRYLIC / CAPRIC TRIGLYCERIDES, ETHYL LINOLEATE, HEXYLRESORCINOL, SODIUM BENZOATE, POTASSIUM SORBATE, XANTHAN GUM, LACTIC ACID, TETRASODIUM EDTA, SODIUM HYDROXIDE.